It's been almost 4 months since I landed in New Zealand. With my visa expiration looming in April, I have to seriously look at what I am planning and where I will be this year. The time here has been good for me. It's been a time to simply relax, regroup with no planning or plans to worry about and not have to wonder where I would be the next day/week/month. And it's been a time to reconnect with this side of my scattered family. But now it's time for decisions. I am considering getting a small Class B campervan to call home, at least for a while. My biggest concern is having a base, which I haven't had for a while. And now that I am (almost) completely houseless, I think a well-equipped, reliable van can serve as my home. After all, I always wanted to go cruising again, and the boat would have been my base. So I can consider a van my land yacht! Silly girls at Christmas! Jenni, me and Zoze. We had a real South African-style Christmas, with family coming and going, with masses of food and laughter. But life here is very low-key and I've doing some cooking with beautiful home-grown fruit and veges. There's been strawberry and blueberry picking at local growers. Our vege garden here is producing a huge tomato and zucchini crop, along with mountains of basil. And at one stage, the avocado orchard was producing so much, we ended up putting them out on the road with a "free" sign, just so they wouldn't go to waste. We experimented with various recipes including a chocolate avo cake with avo frosting for Lionel's birthday! Anything to use up all the abundance! We've done a few day trips and one 3-day road trip so far. We went to the central part of the North Island, an area around Lake Taupo, where we visited Huka Falls, watching the jet boats perform spinners at the foot of the falls, and then the following day, taking a more sedate boat trip up river to see the falls from a different angle. It was spectacular, with vast torrents of water cascading through the narrow ravine and over the falls. In the bright sun, the brilliant turquoise water looked almost tropical - until you felt it and it was freezing! 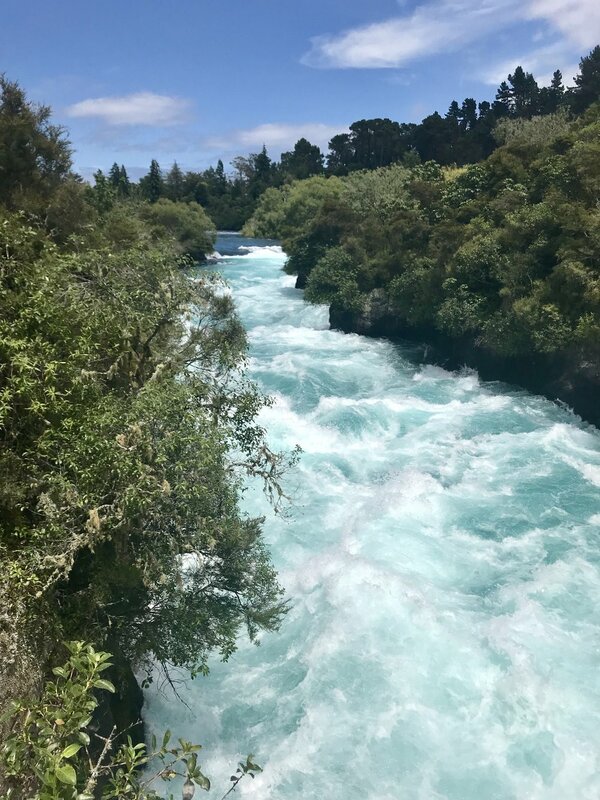 The water at Huka Falls is an amazing tropical turquoise. Maori have given the glowworms special status as the first light known to mankind and called titiwai, meaning "hang them or place them like stars above the water." We went to see the glowworms at Waitomo, but not the main, tourist area. Jenni and Zoze had been before on a private tour that took us onto a local farm where we walked narrow pathways, wearing headlamps, stopping at various spots, lights off, to see the glowworms lighting the walls and overheads of the caves. There are literally millions of them and reminded me of seeing the Milky Way on a dark night. Stalagmites and stalactites reach towards each other, each drip of water bringing them closer together in a hundred years or so! The highlight was a short boat trip, no lights into another cave, where we floated down the river, completely lit by the glowworms. The beaches are spectacular here; miles and miles of wide open sand and more often than not, very few people. Zoze and I were brave during one of the very hot spells and swam, and the water wasn't too cold, but definitely not Tahiti! So with a couple of months to go, we have a couple of small trips in mind, one a full day trip out on a boat to the islands off Tauranga where we should see dolphins and whales and also a chance to go kayaking. And I will begin my quest to find my new land yacht home in California. Below is a compilation (a bit long) of a few photos from my 2017! And below the video, some images from New Zealand. I had an extremely busy travel year in 2017. So I gathered together a few of the thousands of photos I took.